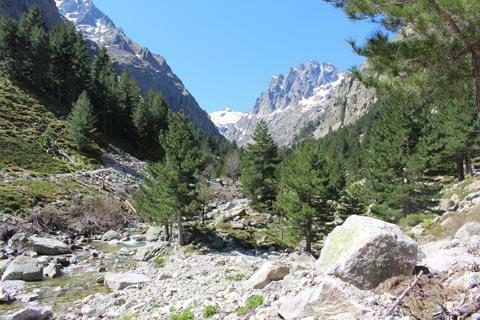 The Restonica valley, in the mountains to the west of Corte in central Corsica, is one of the most popular destinations in the region because of the relatively access to the beautiful mountain scenery. 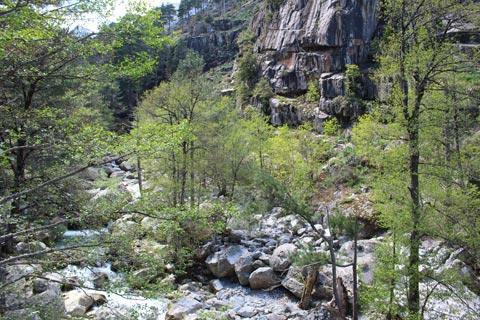 Because of its natural beauty and the need to protect the environment the valley is protected as a 'Site Classé as well as being part of the Regional Natural Park of Corsica. 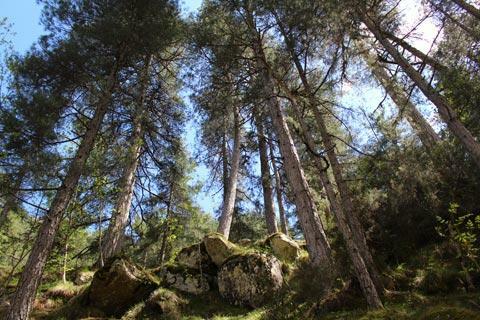 To reach the Restonica gorges, follow the D623 road to the south-west of Corte. 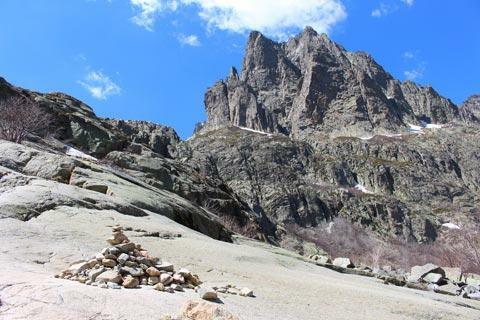 After about 15 kilometres passing through the valley the road ends at a car park (charge payable), where the popular walk to Lake Melo and Lake Capitello begins. Note that large vehicles (more than 4.5 metres long or more than 1.9 metres wide) are not allowed on the final part of the road, and traffic levels on the road can be restricted in high season. 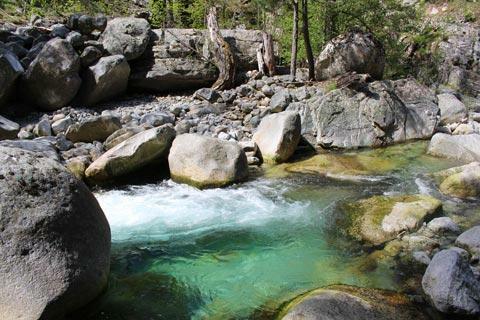 The drive along the gorges is very pleasant with frequent places where you can stop and enjoy the views, both of the river valley below with its boulders and quiet pools of green water, and the trees and mountains ahead of you. If you prefer to walk you can stop at the car park at Chjarasgiolu about two kilometres along the road from Corte and walk along the trail that follows the other side of the river for several kilometres. Along the way there are places where river bathing is possible, and there are lots of attractive places to enjoy a picnic. This trail to Lakes Melo and Capitello is one of the most popular attractions in the area around Corte, but that does not mean it is easy! If you are prepared for a walk in the mountains with sensible footwear and water it will not be too much of a challenge but if you set off from the car park in your flip-flops I don't think you will get too far. Trainers will be OK but a lot of the ground is loose rock and can be slippery so proper shoes that support your ankles are a much better idea. There is no phone signal in the valley so you really want to avoid twisting an ankle if possible! 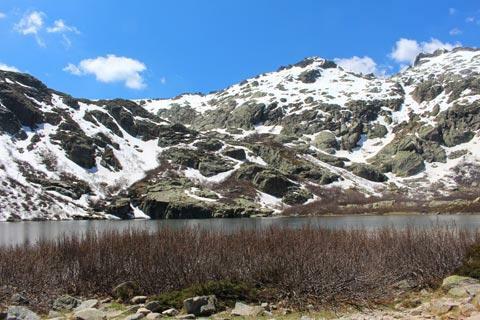 The walk from the car park to Lake Melo takes about one hour, then an additional 45 minutes to reach Lake Capitello. The part from Lake Melo to Lake Capitello can remain closed by snow until June. The walk to Lake Melo starts very easy and with nice views to the mountains ahead. It slowly becomes steeper and steeper until before you actually reach the lake you have to traverse a section where chains and ladders are in place to help you. There are quite a few places where you are clambering or climbing up rocks, but nothing too challenging if you are reasonably fit. You eventually reach the lake and are rewarded with a lovely view across the lake as well as plenty of places to sit and enjoy a picnic. 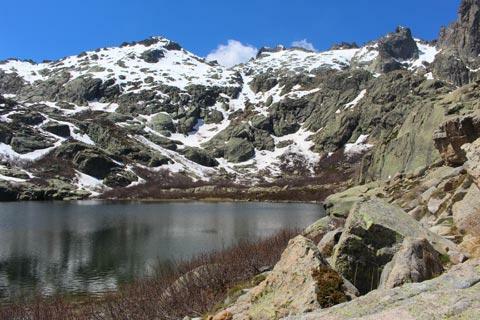 Alternatively you can continue onwards to reach Lake Capitello - follow the path to the right of Lake Melo. 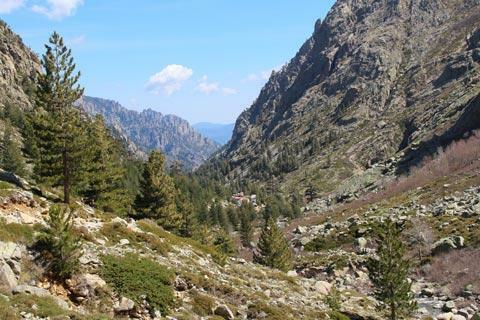 The track is still steep but you will be diverted by the lovely views across the mountains of central Corsica and soon reach the scenic views across Capitello. 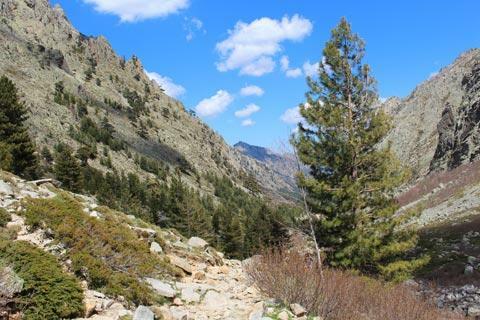 France This Way comment: overall the walk to the lakes is one of our favourite days out in central Corsica and highly recommended. You will of course explore Corte during your visit to this region: see the Corte guide for details. 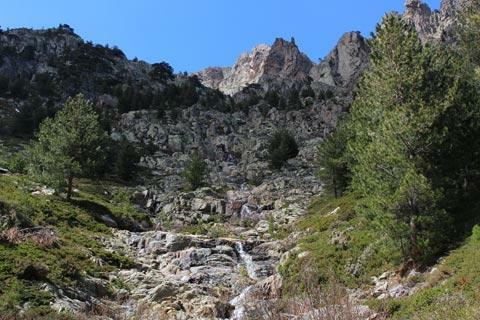 There are numerous opportunities to explore the natural environment in this part of Corsica, depending on your time available and capabilities. The Gorges du Tavignano, just north of the Gorges de la Restonica, are among the most visited and most spectacular.